Pharm. Lere Baale, director, Business School Netherlands (BSN), has applauded Pharm. Ahmed Yakasai, saying Christian pharmacists have a lot to imbibe from his exemplary leadership style. Speaking during the 2018 annual meeting of the Christian Pharmacists Fellowship of Nigeria (CPFN), which held recently at International Conference Centre, Ibadan, Oyo State, Baale praised the outgoing president for his resilience and steadfastness. L-R: Pharm. Lere Baale, director, Business School Netherlands; Sir Ifeanyi Atueyi, managing director, Pharmanews Limited; Pharm. Olakunle Ekundayo, managing director, Drugfield Pharmaceuticals; Pharm. Maxwell Obeka, president, Christian Pharmacists Fellowship of Nigeria and Pharm. Elijah Mohammed, registrar, Pharmacists Council of Nigeria (PCN). The trainer explained that, for what it is worth, pharmacists should continually thank God for bringing in a leader like Yakasai to restore sanity to the profession. “I am using this testimony without stepping on toes. As Christians and men of honour, pharmacists should not be seen humiliating fellow pharmacists. “Instead, when people see us, our lives must reflect the goodness of God. We are salt of the earth; and, of course, we know what happens when salt loses its taste,” he emphasised. Continuing, the pharmacist charged the large gathering of Christians who turned up for the event not to get entangled by worldly allurement. Reminiscing, the NBS director noted that he faced so many challenges prior to becoming who he is today. “I was told that I would not become a director in Pfizer. Guess what? I did. I was told that I would end up searching for a job. I did not. The truth is that nobody can determine your fate,” he said. Continuing, he said, “Being a workaholic, I am not the best husband. But God blessed me with a wife that I see as a mother. Therefore I will say that for positive things to start happening, you must give your life to Christ,” he opined. Another guest speaker, Pharm. Olakunle Ekundayo, managing director, Drugfield Pharmaceuticals remarked that every man is blessed with a seed of greatness. “I am saying this because most of us here know the story of how Drugfield started out with one single product. The moral is that we should not despise the days of humble beginning,” he said. The pharmacist narrated how the death of his father almost put an end to his education at age five. According to him, his mother had to rely heavily on her bean cake business to salvage the situation and knitting the family together. Ekundayo recalled that shortly after he left Pfizer and Doyin Pharmaceuticals, his last place of work as plant manager, he contemplated going into penicillin production with a bit of doubt. According to him, for every hurdle he scaled, a new obstacle surfaced – from getting a premises to inadequate capital, his problem kept getting piled up by the day until God used the then director of inspectorate division in NAFDAC (Alhaji Adebiyi) to help him out. “As I said before, there is a seed God gave each of us. For instance, when our daddy here, Sir Ifeanyi Atueyi, tells you how he started his Pharmanews journey, you will appreciate the power of small beginning. “There was a time that I used to panic over how to pay salaries until I handed everything to God. Today, our payroll is in excess of N60 million,” he stressed. Christian Pharmacists Fellowship of Nigeria (CPFN) is a non-denominational fellowship group comprising pharmacists across the country and in Diaspora. In attendance were Pharm. Maxwell Obeka, president, CPFN; Ike Onyechi, immediate past president, CPFN; Prof. Cecilia Igwilo, member and Pharm. 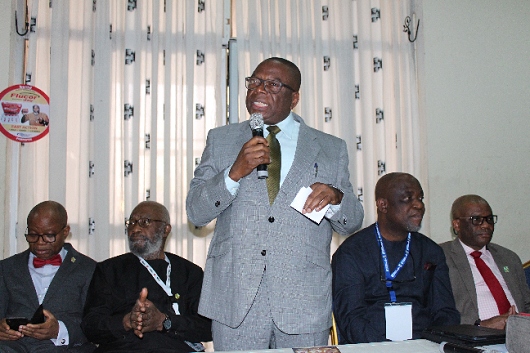 Elijah Mohammed, registrar, Pharmacists Council of Nigeria (PCN).